Well, as I sit and listen to the rhythm of my baby’s heartbeat…it’s extra adorable today, I can settle into this show. I try not to watch too much television, since I want my baby to experience her mother getting out and enjoying life…you know, like yoga classes, farmer’s markets and giving my talks about attachment parenting (which I don’t get paid for…in fact, no one asks me too, but what they don’t know is that they NEED me to). Blanche is furiously cleaning the house and fluffing pillows, awaiting the arrival of her sister. She’s nervous because she never liked her sister. Probably because their parents practiced gross neglect like putting them down in a playpen. She tells the story of how her sister tricked Blanche into holding the Christmas tree star and then electrocuting her. Meanwhile, the rest of the women are taking care of the infant son of a neighbor who is in the hospital. Blanche is annoyed that the baby is there when her sister is due to arrive. “Does she eat babies?” quips Dorothy. I know it is supposed to be a joke, but that reminds me, make sure I tell you about how I freeze-dried my placenta and take it as pills. Did you know we are the only animal on earth that doesn’t eat the placenta? Read more about it on my parenting blog. Also, I’d like to go on a long diatribe about how they are not holding them correctly. Secondly, how many books have they read on the subject of child rearing? How many support groups have they been to? My guess is NONE! Outrage that they should show this on television. Frankly, it’s irresponsible. 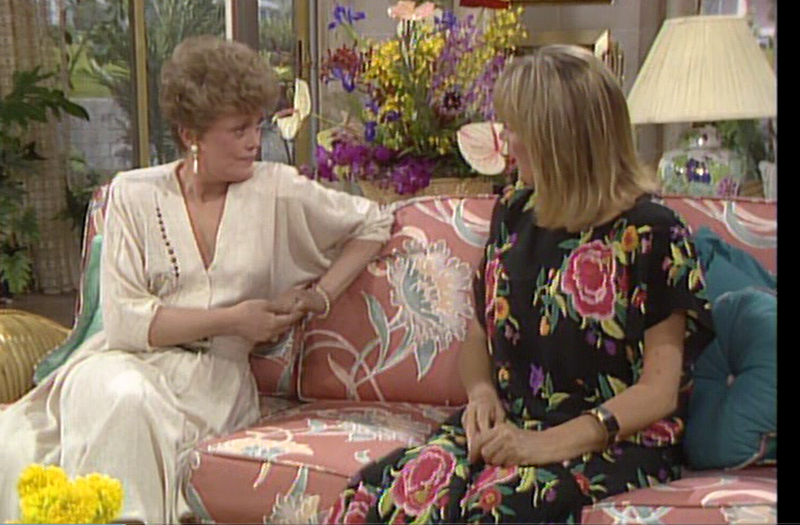 Blanche’s sister is a perfectly nice woman who wants to bury the hatchet with Blanche, but Blanche is suspicious that the sister wants something- turns out, she is dying and needs a kidney. Oh my! But that reminds me, the pediatrician said that my baby has the healthiest kidneys he’s ever seen. It must be because I’ve started practicing Elimination Communication, or EC as we call it. See, I hiss in my baby’s ear and then he knows to go to the bathroom. I’m saving the environment by not using diapers and also NOT giving my baby a complex about deification for the rest of his life. What were we talking about? Oh yes, Blanche’s sister’s kidney. She decides to go through with it, since she wants to forgive and start anew with her sister. At the last minute, she arrives home and tells them she didn’t have to do it, because her blood cells were too small because of course, Blanche has always been a petite woman! The gals decide to celebrate by going out on the town…or diving into some Rocky Road ice cream in the fridge. That reminds me that I lost the weight so quickly after my baby people thought I was sick! They kept asking me out about it! I mean, seriously, can we stop shaming thin people already? Read my blog. Fashion award goes to Blanche’s sister, whose name I didn’t even bother to remember for this recap. Because it’s a drop waste floral number, and I own a similar dress that gets me lots of compliments. Rose holds her breath in elevators. Episode discussion question: did they really think that the audience couldn’t tell that for most shots, the baby was a prop doll?